Add our store to your favorites and receive exclusive emails about new items and special promotions! Dell PowerVault MD1000 3U Storage Array Unit Dual SAS Controllers RPS + 15 Trays. 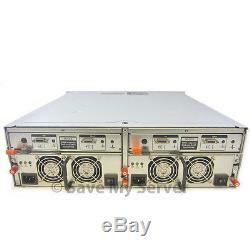 MD10003U-Dual SAS Controllers-RPS 15 Trays. 488W Hot Plug Power Supplies - No power cords included. 15 x 3.5 SAS/SATA Drive Bays; Caddys for unoccupied bays not included. Dual 10/100MB RJ-45 Ethernet Ports. No OEM discs, packaging, or manuals included. 15 3.5 SAS/SATA Hot-Pluggable Hard Drives. Maximum Supported Capacity of 30TB as 15x 2TB SATA HDDs. 15K SAS in: 73/146/300/450/600GB 10K SAS in: 300/400/600GB. Dual SAS Interface Controller w/ Battery & WB Cache Per Controller. Dual Port x4 1x Input 3GB SAS (SFF-8470), 1x Output 3GB SAS (SFF-8470). No Power Cables, No Password Reset Cable, No External SAS Cables. At SaveMyServer we stand behind our refurbished servers. For our testing process we follow the same routine that we use to load our production servers. Build an array (if applicable). Whatever we cant use, we recycle. SaveMyServer Item Information: 10EE - Eric - 4929 qid: 29104. 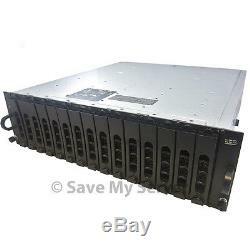 The item "Dell PowerVault MD1000 3U Storage Array Unit Dual SAS Controllers RPS + 15 Trays" is in sale since Tuesday, September 23, 2014. This item is in the category "Computers/Tablets & Networking\Enterprise Networking, Servers\Network Storage Disk Arrays\SAN Disk Arrays". The seller is "savemyserver" and is located in Suwanee, Georgia. This item can be shipped to United States, Canada, United Kingdom, Denmark, Romania, Slovakia, Bulgaria, Czech republic, Finland, Hungary, Latvia, Lithuania, Malta, Estonia, Australia, Greece, Portugal, Cyprus, Slovenia, Japan, Sweden, South Korea, Indonesia, Taiwan, Thailand, Belgium, France, Hong Kong, Ireland, Netherlands, Poland, Spain, Italy, Germany, Austria, Israel, New Zealand, Philippines, Singapore, Switzerland, Norway, Croatia, Bahamas, China.